Picture yourself driving along a highway, a high-speed roadway with a physical median, a route you know by heart. Traffic is light and you may have wearied of seeing yet another bumper sticker, more brake lights, but you are still unprepared for a different image — Headlights. It is an image that would frighten even the most adept of drivers. Wrong-way drivers are a relatively rare sight, but wrong-way accidents are frequently catastrophic and often fatal. With specific experience dealing with catastrophic accidents, our Palo Alto car accident attorney is prepared to help innocent parties left injured or grieving by these terrifying crashes. Last Thursday, as detailed by the Contra County Times, a Palo Alto wrong-way crash claimed one life and left another person facing major injuries. At 12:52 A.M. on September 11, police received reports of a wrong-way driver heading north in the southbound lanes of Highway 280 by El Monte Road. Less than ten minutes later, the driver collided with another vehicle near Page Mill Road. Twenty-three year old Brian Devoto of Santa Clara died in the crash and an unnamed female driver suffered serious injuries. As of Friday morning, police were still working to determine which of the drivers was the wrong-way traveler and also looking at whether alcohol or drugs played a factor in the deadly incident. In December 2012, the National Transportation Safety Board released a Highway Special Investigative Report titled Wrong-Way Driving. The study defined wrong-way driving relatively narrowly, focusing only on incidents that occurred on high-speed divided highways or ramps for such controlled-access roadways. The NTSB found wrong-way crashes were relatively infrequent, accounting for about 3% of the accidents on those roads. However, given that they tended to be head-on events, wrong-way collisions tended to be more serious and more often fatal than other forms of highway accidents. Reviewing national statistics for 2004 through 1009, the NTSB found an annual average of about 260 fatal wrong-way crashes that claimed about 360 lives per year. The agency uncovered 1,556 wrong-way drivers across the time frame and found 60% or 936 of the drivers showed indications of alcohol use. In contrast, only 126 or 6.5% of the other drivers in the collisions (i.e. 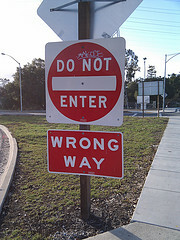 the “right-way drivers” involved in wrong-way accidents) showed indications of alcohol use. Additionally, the study found most of the wrong-way drivers fell between ages 20 and 50, although drivers over 70 were over-represented (i.e. there was a higher percentage of older drivers in the wrong-way set than in the right-way set). We understand how critical it is to recover compensation when an injury has major life-long consequences, compensation that covers future costs as well as those already incurred. We also understand the sensitivity of both major injury cases and wrongful death claims. When you engage our firm, you are getting top-notch legal representation delivered with the utmost respect for you and your loved ones. Wrong-way crashes are relatively rare, but almost always leave behind tragic results. If a wrong-way driver has forever altered your life and that of your family, call our Northern California catastrophic injury law firm at our Oakland, San Francisco, or Santa Rosa offices. We are here to help you as you learn to move forward from tragedy.